I'm sitting at my desk in the staff room of my city school in Gunsan, where I teach four days a week. I had three classes this morning and will teach one more later this afternoon, and my mood is good. Everything is prepared; I'm ready for this afternoon, for tomorrow, and actually for the next two weeks. I know what is expected of me, I know what is going on around the school, and I'm completely comfortable in this moment. If anybody had told me it could be like this way back in March, when I was stressed and overwhelmed and questioning my life choices, I would never have believed them. I remember feeling very lost, back then when we first arrived. I felt I had too much responsibility, and too many people were watching me flailing about, doggy-paddling madly in a choppy ocean of strangeness and embarrassment. I did not know what I was doing, it's as simple as that, and I was incredibly uncomfortable. My co-teachers would not tell me what they wanted me to do, even when asked directly, and the students were largely unresponsive when they weren't being outright disrespectful. I'm doomed, I thought. I can't compete with classes of 36 bored, resentful teenagers. I can't cope with the lack of communication from colleagues. I can't get my head around this high context culture where saving face is more important than making sure people have the necessary information to actually do their job properly. My first lessons were terrible. My materials were inappropriate and my presentation was poor. I didn't know how to manage the time properly, and I really didn't know how to manage the students. It felt like I was drowning. A natural response to finding yourself engulfed in a language and culture you don't understand is to turn inward. I was in a busy place all day, people chattering noisily all around, but the only person I could communicate with easily was the voice inside my own head, so that is where I largely stayed. Alone, I chewed over the inconsistencies and perceived slights dealt out by these indecipherable, frustrating, foreign people. Why was I suddenly expected to run a 45 minute class when nobody had given me any clue how to prepare? Why was nobody bothering to inform me of schedule changes until five minutes before they took effect? Why were the students obsessed with my blood type, face shape, and whether or not I have babies? I had a lot of trouble relating to Koreans, in the beginning. All I could see in many of their actions was the opposite of what was familiar to me. I knew, intellectually, that Korean society runs according to different social rules than I am used to. Korean history, traditions, and philosophies have shaped a people very different from those of the western societies I am familiar with. And yet, despite being aware of these dissimilarities, I was not prepared for them. One important difference between Korean culture and western cultures is how strangers relate to one another. Whenever I started a new job back in New Zealand I can remember being introduced to everybody in the office, and often a buddy was assigned to show me the ropes and be a first friend in the new place. There were training periods and instructional literature, and time was made for questions and feedback. Westerners like to talk; our societies are generally low context, meaning shared expectations and experiences are not necessary for communication. We'll talk and talk and explain away, possibly too much, because very little is assumed just from the context. Koreans however live in a high context culture, where the opposite is true and many things remain unspoken. It can take a while for foreigners to accept that they will repeatedly be put in new situations here and many things will simply not be explained to them. Korea is the deep end, and you will learn how to swim on your own. There is a difference, thankfully, between it being assumed that you can keep your own head above water and actually being abandoned. In my time here I have experienced, first hand, how warm Koreans are as people. Generally speaking, they love to share, they love to eat together, they are often very tactile, and while there is a definite competitive streak, there is also an innate compulsion in the strong to help along the weak, particularly in the classroom setting. Becoming friends, or even just acquaintances, with a Korean person can be immensely rewarding and gratifying, just as with all other peoples. The issue for westerners is to recognize and remember that the way you are treated as a stranger here is not the end of the story. 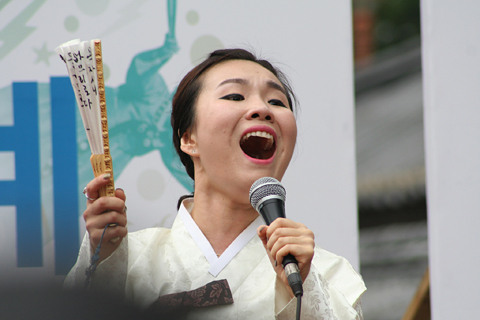 It is true that, in contrast with the way westerners may make eye contact with those they pass on the street or exchange pleasantries with their neighbours despite not knowing their names, Koreans are more likely to look away and remain in their own bubble when confronted with somebody they don't know. Even in a controlled setting like a middle school, this hesitance to interact with strangers combined with the language barrier, and all mixed up in a high-context culture, can lead to what some guest English teachers experience as coldness or indifference. Trust me though – it really isn't. As I came to get to know more of my colleagues, as they found their confidence with English and I learned to relax and keep my guard down, things did improve. The students, in particular, are now completely different people to those I encountered in my first few lessons. It seems obvious, but people need time to adjust. I wasn't the only one dealing with new things back in March; the students were also in new classes after a long winter break, they had their middle school hierarchies to feel out, reorganised routines to get into, and of course I was completely baffling to many of them. Modern Korean children are exposed to some western, usually American, culture through pop music and blockbuster movies, but there are still not that many of us running around their neighbourhoods, particularly outside of Seoul and Busan. Even if they were not surprised by how their new English teacher looked, they were certainly thrown off by the way I talk. There are many native English speakers, even members of my own extended family, who at times have trouble with the Kiwi accent and my rapid rate of delivery. It is not really surprising then that it took the students a little while to get their ears around my strange vowels and dropped Rs. The most important factor though has been getting past that initial wall that Koreans throw up when faced with strangers, and the only thing that can break through that defense is time. Now, six months later and from the comfort of the other side of the stranger wall, I see many similarities between Koreans and westerners that had previously escaped me. There are traits, behavioural quirks, which mean I can never forget where I am. The sense of being a fish out of water, to borrow an idiom I taught just last week, is gone however. There are still bad days, days when certain students feel the need to keep pushing the boundaries, days when I get frustrated at the inefficiencies of the local education system and the negative effects of the intense learning culture, but these are the exception. Now I can't walk across campus without half a dozen students calling out “hello Emma Teacher!” with grins on their faces. They write me notes, draw pictures for me, get excited when they see me around the neighbourhood after school. I've even had to learn some of the boys' secret handshakes. Many of my colleagues are now friends, with whom I exchange text messages, go out for coffee, and attend a local book club. I am connected to these people, and with over five months left to go on my contract I can already tell that I am going to miss my life here immensely. It wasn't what I expected, and there are times I have been deeply unhappy here. Life is crests and troughs though, and you need to hang on. The Korean wave will carry you ashore safely, if you give it time. Our Korean summer has ended rather abruptly. Temperatures have dropped to the low and manageable 20s, and we are currently in the midst of a third minor typhoon, bringing ever more rain. Now is the prime time for tourism in Korea, and we intend to make the most of it. 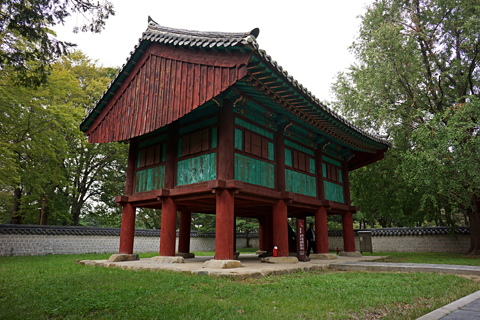 Before we even came to Korea we were aware of Jeonju, the capital city of our province which lies just an hour east of us by bus. The most famous attraction in this pleasant city is its Hanok village, featuring traditional Korean dwellings which are built according to the baesanimsu principle, in which the ideal house has a mountain to its back and a river in front. Jeonju is also famous for its local version of one of our favourite Korean dishes, bibimbap, which we made sure to devour for lunch. Since the beginning of the year we had been planning a trip to the Hanok village, but kept putting it off in favour of other, more remote destinations. Last Saturday we finally hopped over to take a look, and found ourselves in the middle of a sori festival. There were musicians and other performers dotted in between the shops and market stalls, and although the festival appeared to be well supported the streets were not uncomfortably full. We took our time wandering amongst the old but colourful and well maintained buildings, enjoying the relaxing weather and surroundings. On the way out we picked up a bag of delicious walnut cakes and so concluded our quickest and easiest tourist outing to date.